This year I’m taking on a number of additional duties, on top the usual research, teaching and administration requirements of a tenured academic in the 21st Century. Among them is my role as an inaugural Fellow of the Australian Council of Deans of ICT’s Learning and Teaching Academy. I’ll call it ALTA from now on because it takes a very long time to type. We’re still in the planning stages for exactly how we, as a group of fellows, will bring together the people who are carrying out good learning and teaching in Australia but I thought that I could blog some of my own early thoughts here. So that is a quick diagram I drew up using Adobe Ideas. I love having an electronic sketchpad but the flow of my hand across the relatively cramped screen of an iPad often gives me jittery lines. Enter Ideas, which smooths the lines and makes up for my rubbish neural feedback. My first question is “What do the arrows mean?” We can see the words “learning” and “teaching” on the screen, but it’s not immediately clear what the arrows signify, nor the relationship between the bubbles themselves. Normally, I’d draw this diagram and get people to think about the way that information flows when we are conducting one or other of the activities in question. Then, it starts to make sense. The arrows show information flow. Teaching is all about the flow of information out of the person who has it, and learning is all about the flow of information in the person who wants to learn. I like this diagram because it also hints at one of the core issues in both activities – as a teacher, I can push my knowledge out but, once it leaves my boundary, there’s no guarantee that it’s going to be any good. Similarly, the act of learning requires the learner to bring the knowledge into their own sphere and then carry out some work on it. 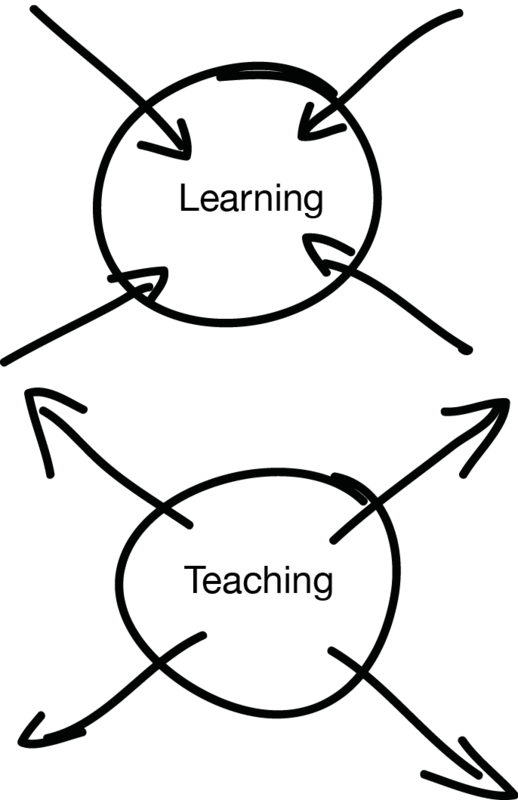 The bubble boundaries signify the locus of control in both activities. I have deliberately not connected the two bubbles together because there is a medium of exchange that the knowledge has to traverse – if I accept that there is no guaranteed connection between learners and teachers, then it’s up to me to think about the way that the largest number of teaching arrows end up in a space where a learner can grab them and start doing something with them. In designing good educational activities, I have to think about the role of the teacher, and the learner, and the vagaries of the mechanism if I want to succeed. I’ve deliberately avoided words like teacher or student in the diagram because good teachers are also, quite frequently, learners and some very good students are also teachers, of themselves, of their peers and as part of the informative framework that makes teachers better teachers. The diagram also has one more important function for me as it clearly illustrates that some of my learners are learning things from other people, whether it’s uni work, life or how to juggle relationships, the knowledge that I’m trying to share is only one part of their sphere of influence. I’m competing with other interests and I should always keep that in mind. At the same time, if my students thought about it, they’d understand that I’m teaching more than just them and that could explain why I make some of the decisions that I do. It’s a simple diagram but it’s effective. Or, at least, it is for me! Is this diagram clear to you now? It is helpful? Could it be better? What do you think?